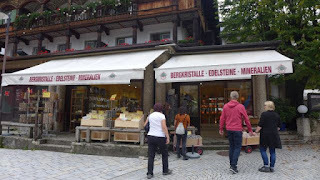 Today we would be making a day trip to Berchtesgaden in Germany from Salzburg in Austria. Although the 2 cities are in different countries, the distance is not too far, about 30km from Salzburg or 45 mins by bus. 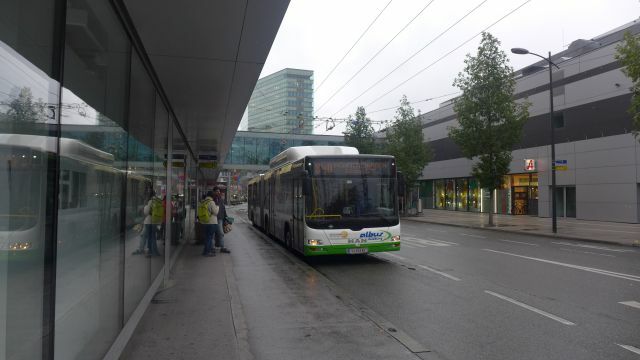 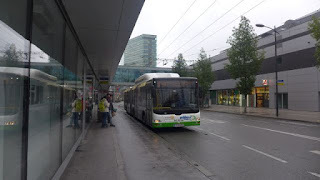 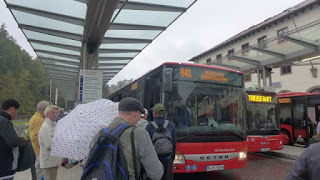 For our day trip to Berchtesgaden, we took the 840 bus from Salzburg bus station at Platform G, taking the 8.15am bus. 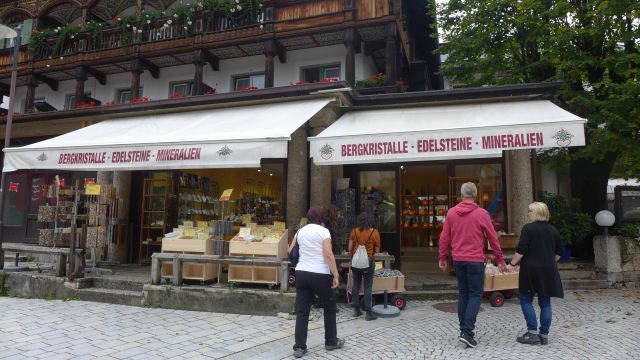 We bought our day ticket (tageskarte) from the bus driver for EUR 10.20 per person and it took only about 45 minutes to reach Berchtesgaden. 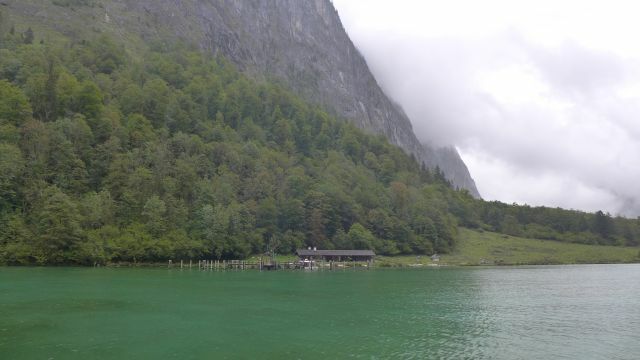 From there, we had to change to bus 841 to go to Konigsee, using the same day ticket. It was raining since morning, but we had already anticipated this weather based on the forecast, so we had our waterproof jackets and quick dry pants on. 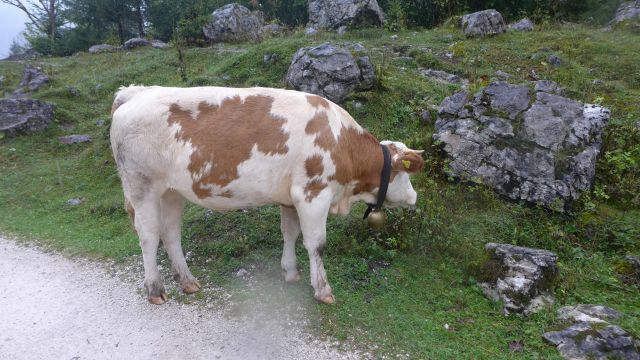 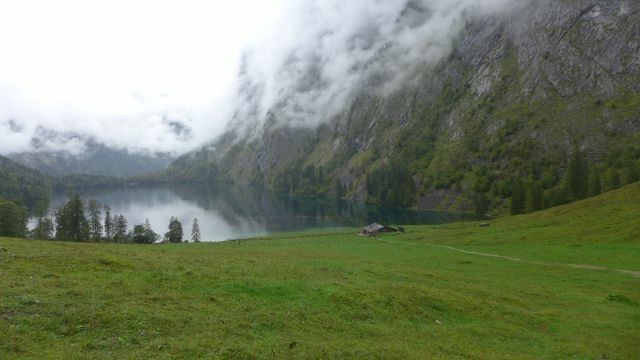 When we reached Konigsee, it was already full of tourists. We bought our return ferry ticket to Salet for EUR 18.50. 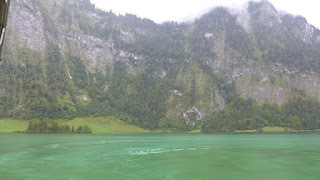 It is recommended to take the ferry ride onwards to Salet, instead of just St Bartholoma as the hike at Salet promised a magnificent view of the Konigsee lake (or King's lake) and its surrounding mountains. 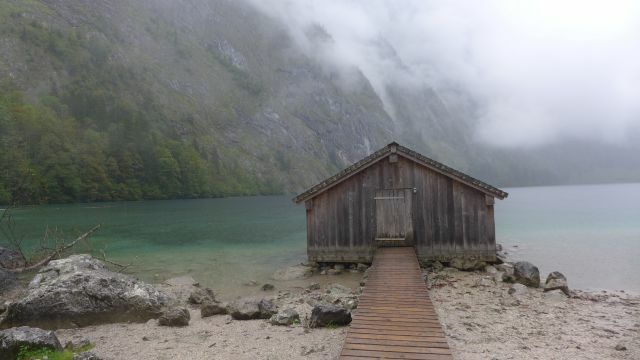 We were also aiming for the view point of the solitary hut at Obersee lake, which is one of Windows desktop wallpaper. 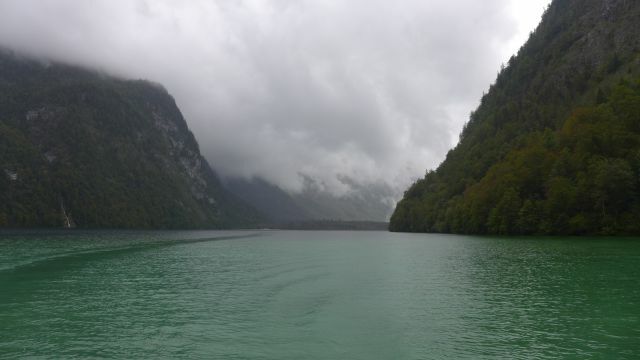 Our ferry this morning was full with a tour group. There was a playing of the trumpet so that we could hear the sounds of the echo reflecting from the mountains. 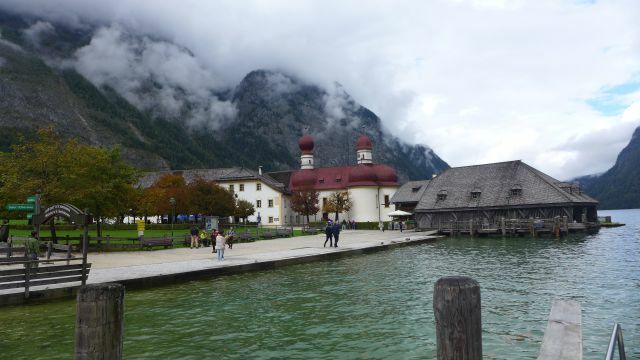 The ferry ride from Konigsee station to Salet took about 40 minutes, with the first stop at St Bartholoma. It was still raining when we reached Salet, but still we proceeded with our hike to Saletalm hut at the Obersee lake, just a few minutes walk from Salet jetty, then onwards to Fischunkelalm hut, which took about 1 hour. 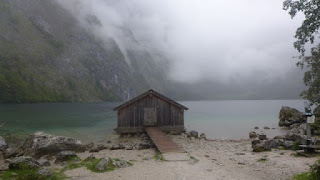 Luckily the tour group stopped short of Saletalm hut, then turned back to the jetty to make their return journey. So we had the lakes for ourselves until the next ferry arrived, enjoying the serenity and the breathtaking views of the lake and mountains. 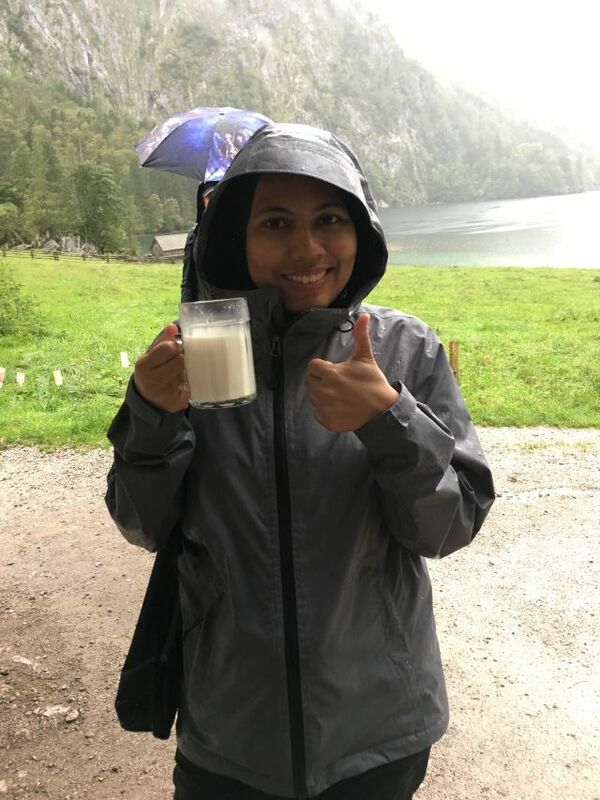 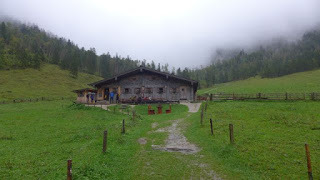 We took a breather at the Fischunkelalm hut, enjoying the fresh milk bought from the hut cafe for EUR2 per glass. 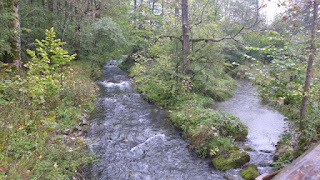 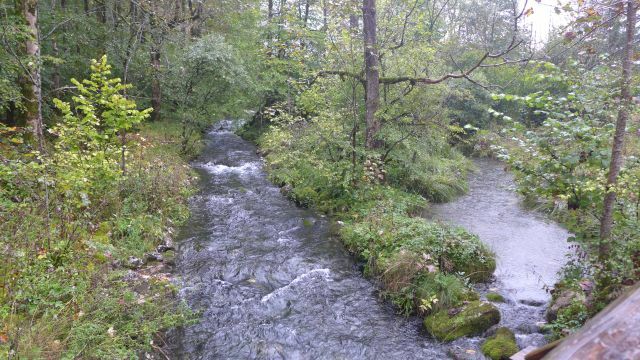 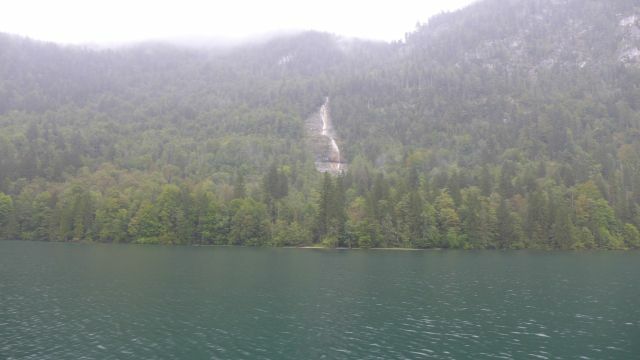 We then hiked a bit to get a glimpse of the Rothbach waterfall and took some pictures from afar. 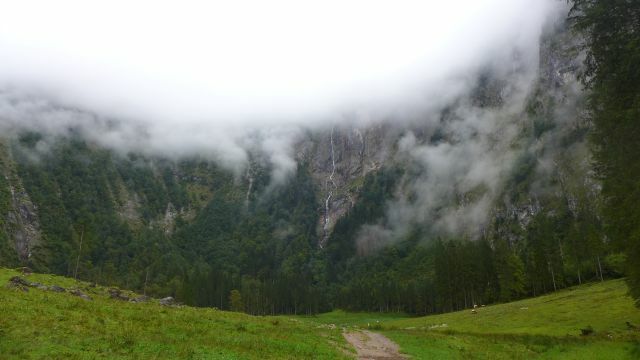 We didn't go to the foot of the waterfall, which is about 30 mins hike from the Fischunkelalm hut. 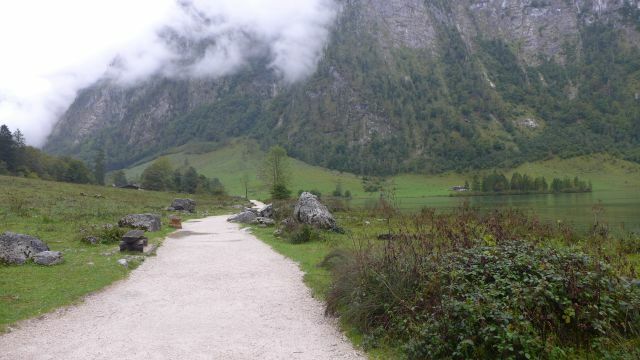 We turned back to Salet jetty and waited for the ferry to return to Konigsee, stopping at St Bartholoma. This time we got off from the ferry to take some pictures of the St Bartholoma church amidst the Konigsee lake. 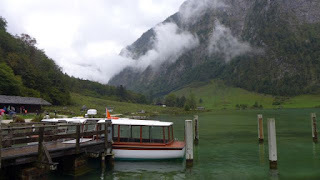 The return ferry to Konigsee jetty was again full, this time with mostly hikers. 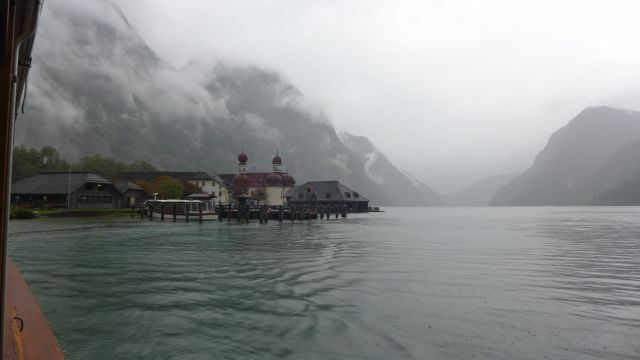 It was already 4pm by the time we arrived back at Konigsee jetty. 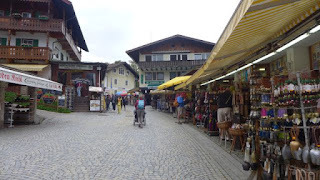 There are many souvenir stalls at Konigsee, so you could do some shopping there. We took the 841 bus again back to Berchtesgaden, then bus 840 back to Salzburg using the same day ticket. 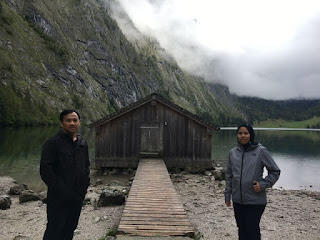 We arrived back at Salzburg at around 5.30pm and took an early dinner at Sofra cafe (halal, not to be mistaken with the Sofra restaurant in Zagreb) of grilled chicken and rice. 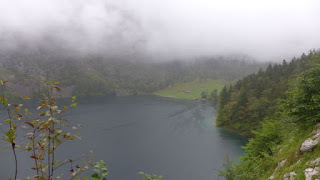 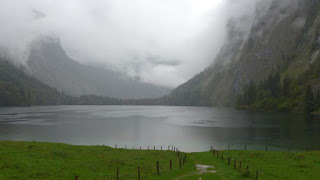 Apart from Konigsee lake, one could also take the Jennerbahn gondola lift to get a vantage view of the beautiful region of Berchtesgaden (although during our visit it was raining the whole day so some views of the mountains were masked by mist); or take the Eagle's Nest tour to visit Hitler's Nazi Party building on top of Kehlstein mountain. 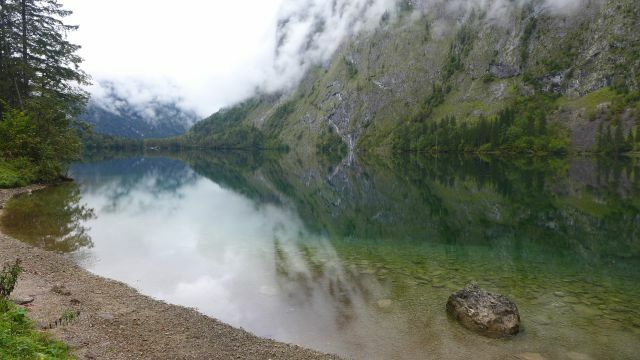 You could also opt to stay in Berchtesgaden if you wanted to do all the activities instead of taking a day trip from Salzburg.